For the past couple of years, I’ve been using Platinum Carbon Black exclusively when I’ve needed a waterproof fountain pen ink. Not only does it dry almost immediately and become waterproof in a matter of seconds, it has never clogged any of my Lamy, Pilot or Sailor pens. Before finding it, I had tried a few Noodler’s inks that were supposed to be waterproof and even “bulletproof” (waterproof as well as bleachproof). In addition to their varying degrees of so-called waterproofness (I wasn’t very concerned about chlorine! ), my main issue was that they seemed to clog my pens. Annoyed and frustrated, I got rid of all those inks and swore never to use Noodler’s again. And once I found Platinum Carbon, I had no need to look further. At one point I wanted a little color variety, so I tried a waterproof blue (Sailor Sei-Boku Blue-Black), but it is a little too bright a blue to use with watercolors (this Gingerbread Village sketch is an example). I also wanted a waterproof brown, and since Platinum behaves so well for me, Platinum Carbon Sepia seemed like a natural choice. Unlike black, however, sepia is too pale and reddish for my taste (this sketch of Santa is an example). After those brief distractions, I stuck with black, and for the most part I’ve been happy. Lately, though, especially in the fall when I was sketching so many trees, I started wanting a waterproof brown again. 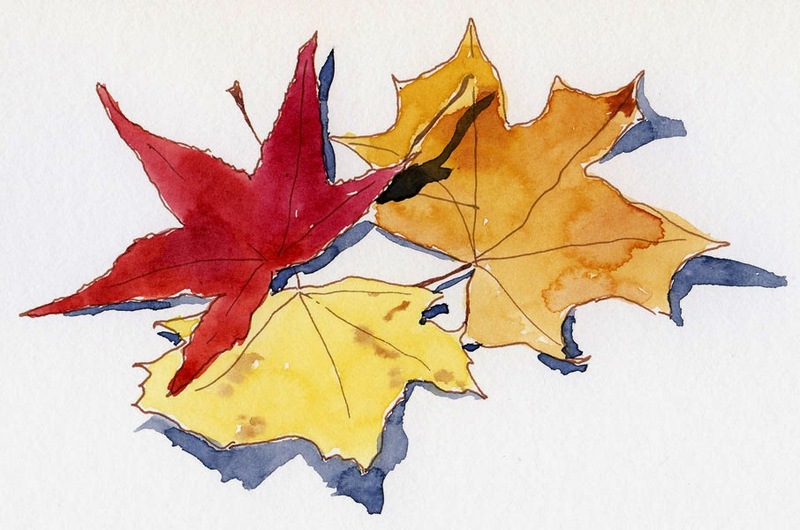 All that red, orange and yellow foliage seemed to demand a warmer ink color than black. Noodler’s #41 Brown is a popular choice among sketchers, so despite my skepticism about Noodler’s, I gave it a try when Peggy offered me a sample. Immediately, I liked the color – a rich, strong, warm brown. I tested it with Noodler’s #41 against Platinum Carbon Black, and its drying time was just as fast as Platinum, if not faster – it was completely waterproof after 30 seconds. I’ve had it in my pen for only a couple of days, so it’s too soon to tell whether it has a tendency to clog (stay tuned). But as of today, it looks like a winner. 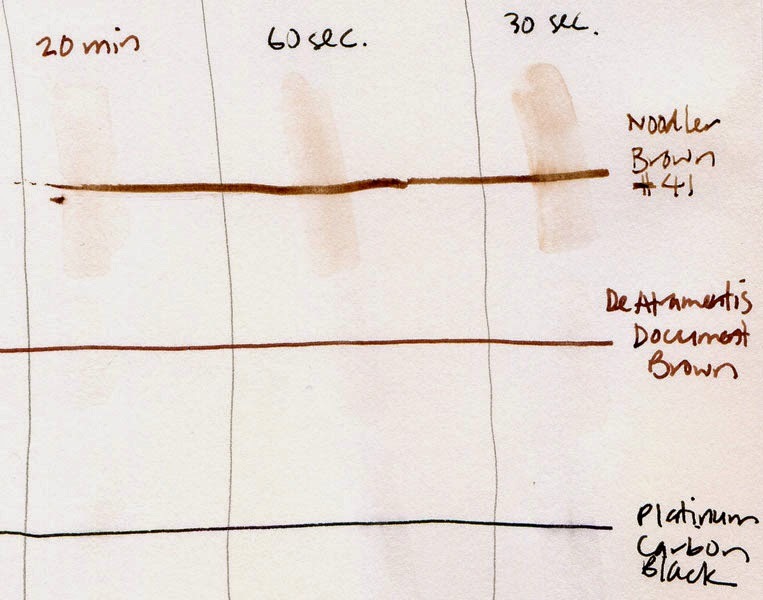 Edited 12/15/14: My idle-time test on DeAtramentis Document Brown is complete; check out the results. Wow, thanks for letting me know about Jane's blog, Larry! What a wealth of info! Dang, you got a bottle??!! It's been out of stock for weeks and still is. Thanks for the review. I'll order a bottle and not bother with a sample once it is back in stock. Arlene, I don't know how humidity affects ink and pens, but I am mainly comparing Noodler's with Platinum Carbon Black, which has never clogged any of my pens. Stay tuned for my idle-time test of DeAtramentis Document! Leaving a pen filled with ink but not used is the true test for clogging! DeAtrementis tests. Liz and Jane have piqued my interest (and everybody else's) in them! I’m on the Urban Sketchers Blog! Plain Ol’ Pen and Ink . . .